The Counseling Center staff strive to be a transformative presence in the lives of our students, as well as with training our interns. We are a multidisciplinary staff, including over 20 clinically trained professionals, including 11 psychologists / postdoc fellows and several other disciplines including Licensed Clinical Social Workers (LCSW), Licensed Marriage and Family Therapists (LMFT), Licensed Professional Counselors (LPC), a Registered Dietician, and 5 part-time licensed independent providers. Our staff have also received extensive trainings in many focused areas that include trauma and sexual assault, drug and alcohol concerns, other addictive behaviors, dialectical behavior therapy, eating disorders, crisis intervention and many more. We are highly invested in our role as a training facility. In addition to our internship, we have had a strong psychology doctoral practicum program for several decades and currently take 4 students a year. We also have 2 Social Work interns and a Higher Education Student Affairs apprentice every year. 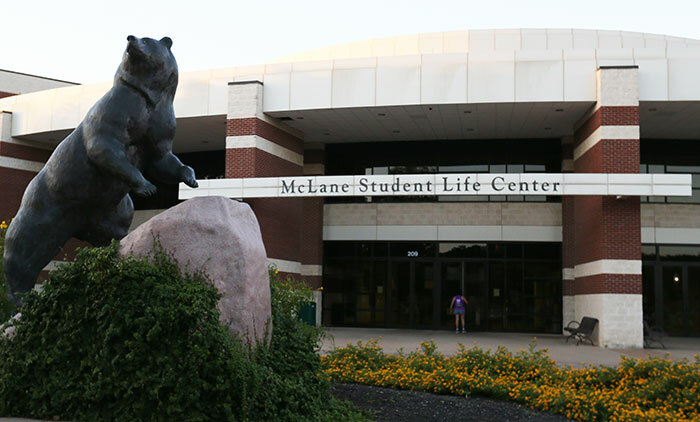 Due to recent expansion, the Baylor Counseling Center is housed in 2 locations on campus. Our original site is called “Baylor Counseling Center – SLC”. It is located on the 2nd floor of the McLane Student Life Center (SLC), adjacent to the Health Center and the Wellness Office. This central location on campus, being surrounded by recreational equipment and activities, and being next to the Health Center, has been a positive experience for us, and how students may think about mental health. The close proximity with the Student Health Center facilitates the referral process between medical staff, psychiatry, and counselors. This part of the Counseling Center completed renovations in January 2016, resulting in a more efficient use of space, more offices, and a more efficient waiting area. We have a conference room, where staff meetings and committee meetings can be held, that also serves as a group therapy room. We share a small kitchenette with the nearby Student Health Center. All areas are accessible to students/staff with disabilities. Our additional location is called “Baylor Counseling Center – Dutton”. It is located on the corner of Dutton Street and University Parks, adjacent to both student housing and the Truett Seminary, and across the street from the Law School. This space was specifically renovated for our counseling center needs and was completed in January 2017. It is the larger of the 2 facilities and houses a large waiting area, a large conference/meeting room, 2 other meeting rooms for group therapy and providing intern and practicum trainings, a room for our Mind/Body Lab, a large break room, and many clinician offices to accommodate our expansion of staff. All of the interns will have offices at the Counseling Center – Dutton location, near the Training Director’s office. This past year (2017-18) the Counseling Center saw 2,884 students and provided over 15,000 appointments to eligible Baylor students. Students that seek our services come from diverse backgrounds and present a wide range of concerns, including relational problems, depressive symptoms, anxiety symptoms, adjustment difficulties, phase-of-life difficulties, bereavement and grief, traumas and sexual assault, academic struggles, attention difficulties, and eating concerns. Typically, we additionally make contact with over 5,000 students through our annual outreach programming on campus. Walk-In Clinic: The Walk-In Clinic is the point of entry for every student who comes to the Counseling Center for the first time. Outreach: All of our staff contribute to psychoeducational events. We are intentional about getting out on campus and having a presence that supports students and familiarizes them with our services. Outreach programming focuses on reducing mental health stigma on campus and providing education on topics relevant to all Baylor students, such as stress management and suicide prevention. Crisis Management: Students in crisis can walk into the office to be seen by a counselor who will assess the level of urgency and provide crisis intervention. During non-business hours and weekends, students can call the Counseling Center (254) 710-2467 and reach the 24/7 answering service, which will connect them quickly to the on-call counselor. Group Therapy: The many types of group therapy all share the commonality of people coming together, under the leadership of a trained facilitator, to work on improving their lives in one way or another. Group therapy can be as powerful and impactful as individual counseling, or more so. Individual: Individual therapy involves meeting one-on-one with a counselor to address specific concerns. Couples: Students are eligible for couples counseling as long as at least one person in the couple is a Baylor student. Specialty Services: Services connecting students with a more intensive program of care focused on a specific mental health concern. Transition of Care: For students requiring a transition of care, the Care Planning Team explains the process and partners with the student to help find a community psychiatrist, therapist or other services to best fit his or her needs. Our vision for the Doctoral Internship in Health Service Psychology is to develop psychologists with the conceptual and clinical competencies necessary to deliver psychological services in a manner that is effective and responsive to individual and societal needs, both now and in the future. The mission, philosophy, training program, and service delivery opportunities at the Baylor Counseling Center make it a great place for interns to grow in 3 general areas: 1) developing core clinical skills to be a transformative presence, 2) developing a multicultural competence and respect for diversity, and 3) developing professional identities as psychologists and as future leaders in the field.